STEINBACH, Man. -- At first Amanda Kehler didn't notice the envelope with a faded address lying among old newspapers and certificates. When she found the $1 box on the weekend, she decided to buy it, unaware it would soon send her on a search for a First World War veteran's family. Kehler owns Prairie Pickers Cafe in Steinbach, Man., with her husband. The couple is often at flea markets, garage sales and estate sales looking for unique antiques for the store. When she got around to opening the aged envelope, she immediately knew it was something special. "I was reading the letter and as soon as it referenced Vimy Ridge, I instantly got chills," Kehler said on Thursday. "Obviously it's such a huge part of our Canadian history. I just knew it was something really special that I needed to get back in the hands of -- hopefully -- a family member." The letter, dated May 1917, was sent from a Canadian veteran named Earl Sorel who was in a hospital in Birkenhead, England. The missive was addressed to a woman in Selkirk, a small city just northeast of Winnipeg. In the letter, Sorel shared with the woman that her brother died during the historic Battle of Vimy Ridge, which had taken place the month before. But, before he died, the brother saved Sorel's life. "The barrage was like a thunderstorm and we were trotting at a good pace. We had gone about 1,200 yards and then 'Bang!' I felt a sharp burn in my back and left arm," the letter said. "The next thing I remember was (Gordon) pulling me in a shell hole and he told me to stay there." It went on to say: "He died a hero, along with many others that day." Stephen Davies, project director of the Canadian Letters and Images Project, learned about the letter and quickly started researching the two soldiers. 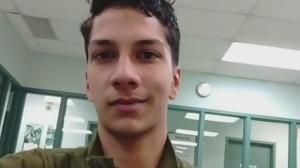 He found Sorel's service file through Library and Archives Canada and learned the soldier was also originally from Selkirk and was only 20 years old when the letter was sent. Davies said the brother killed in the battle was most likely Gordon Rochford from Selkirk. The 1916 census said he had a sister named Pauline Rochford, the same name as on the letter's address. Rochford's service file shows he was only 22 years old, so there's a good chance the two men grew up together in Selkirk. Rochford was unmarried when he went overseas to fight and in the file the young man writes: "In the event of my death I give the whole of my property and effects to my mother." He was killed in action on April 9, 1917. Davies is working to maintain an online archive of letters and images of Canadian soldiers and said he hopes to get a scanned copy of Sorel's letter. He said such correspondence is extremely important in understanding war. "What letters do is reduce the war down to the human level, remind us that the soldiers are just like us," he said in an interview from Nanaimo, B.C. Word of the letter has spread and Kehler has received offers from people who want to buy it. She hopes to return it to members of either soldier's family -- if she can find them. If not, she will donate it to a war museum. Either way, Kehler said, it is truly a Prairie "pickers" dream find. "As pickers you always have this handful of items that always stay with you. This is our 'stay-with-us' item," she said. 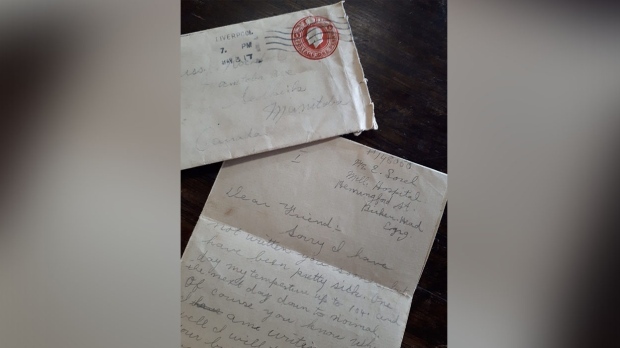 "These people fought in the wars, and we are all grateful for that, but when you read a personal letter like that it brings it really close to home."